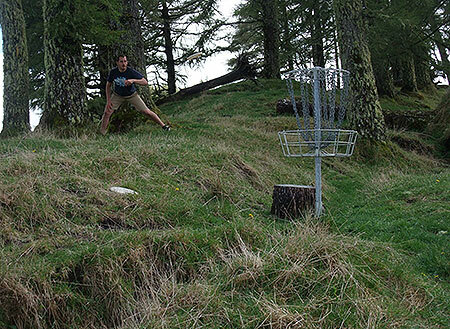 The 2014 Smoking Mountain Disc Golf Tournament. Pete 'flick' Boyle tells the story. 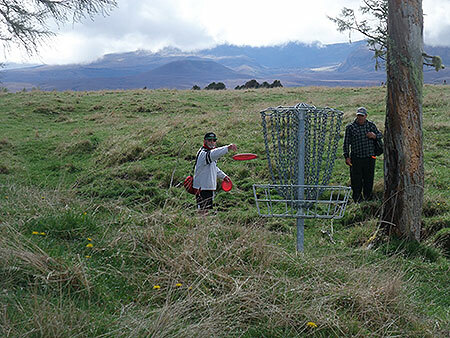 Well it sure was one of those famous King Country autumn weekends for the recent round of the DG Tour held at Discovery Lodge in National Park. Saturday dawned with a wet and windy start and things only got more hostile from there - not quite as bad as last year's venomous conditions, but pretty daunting never-the-less. So much so that AB didn't even make the start line and Shane and Lawton understandably pulled out before the end of the 1st round. I think I would be correct in thinking that the remaining 18 would've had moments of serious doubt about continuing as well. The 2nd round of random draw....sort of...was equally as testing but continue we did and the relief of heading back to DG H.Q. after hole 18 was palpable for all ... What a Day! 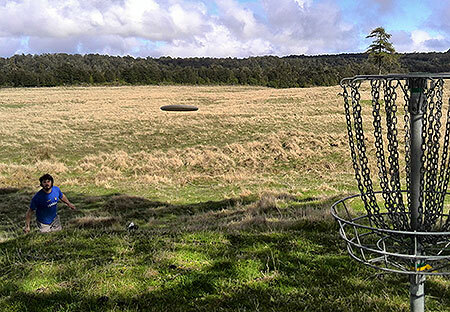 at the end of which Auckland Disc Golfer Brad Muir held 1st place with Bob G 2nd, Jackson 3rd, Blair 4th and Mike Proctor and Pete B = 4th...and that was group 1 Sun morning .... and what a day Sunday was!!!! a virtual wind free, sunny, utterly beautiful Central Plateau corker .... Gemma Sullivan was leading the Women's division on sun a.m and went on to take it out. Round 4 saw Brad still leading with the GM 2nd, Jackson 3rd and Pete 4th, having picked up a couple on Mike P, and that was the top group. The fantastic conditions were reflected in some of the scoring. Brad 53, Bob 55, Winston Rawiri and Pete B 56, with most others improving to some degree. The final round didn't produce such stellar results, but a 56 by Jackson and 59 by the GM had them in 2nd= after Brad, with Pete in 4th. Unfortunately, locals Blair Joines and Bruno Whale had to pull out of day 2 after an accident at home saw one of Bruno's children raced off to hospital ... so best wishes to B and B and family for a good outcome there. Also best wishes to Wellington stalwart Winston Rawiri who is off to Perth to live, so we lose one of our sharp up and comers there...bon voyage bro. 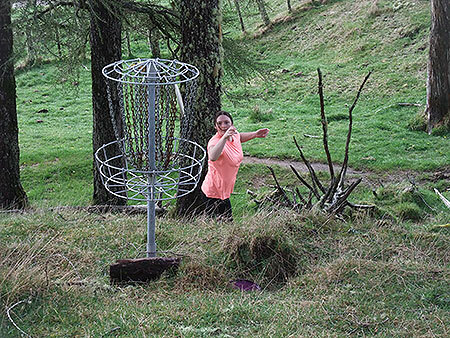 A couple of interesting observations ... if it wasn't for the 6 Wellingtonians, with the brilliant support of their "rock" (and van driver) Steve Fargher, plus the Levin Brotherhood with Patriarch Shane Sullivan and his solid crew of top people (as golfers and personalities) ... Disc Golf tournaments in the North Island would scarcely have enough numbers to qualify as tournaments that count ... a HUGE thanks to them for their passion for our sport. With the South Island 'Lords of Lismore' event next on the calendar, best wishes to the Wanaka crew ... it's amazing to watch the excellent work that is so obviously happening down there in the S.I. 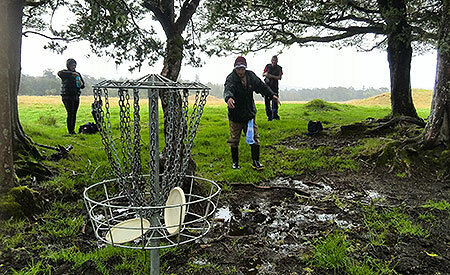 As an aside ... and having been temporally handed the soap-box ... Can I implore Auckland Disc Golfers to try and give Simon and his crew a few hours help to make our upcoming Nationals, the International event it so deservedly should be, because Waitawa really is a course of International standard and every little bit of "enhancement" by helpers will maximise the quality of the event. And that is the story!!!!! Hopefully I'll catch up with a few of y'all at Monte in Auckland over the weekend of November 15 & 16. Puttoo - Levin Brotherhood's Jacko Sullivan with a solid putt at the basket on #2. 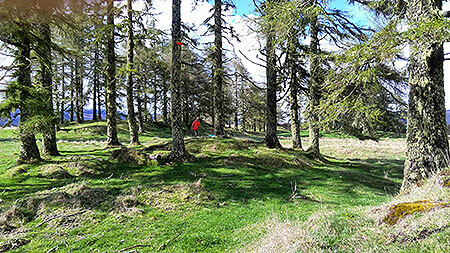 All round skills - Jacko goes to the side-arm flick on the heavily wooded fairway of hole #8. Kabam!- The two was there for the taking on 15. Jackson shows Pete and Brad how it's done. 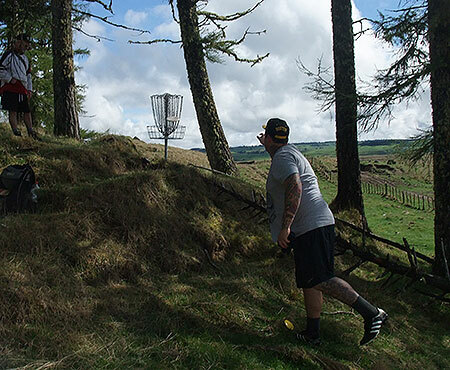 In She Goes - Wellington Disc Golfer Chris Sinai putts out 17 in Saturdays testing conditions. Rusty but solid - Making the most of the better weather on Sunday, Hutt Valley's Sky Heighway slams the chains. 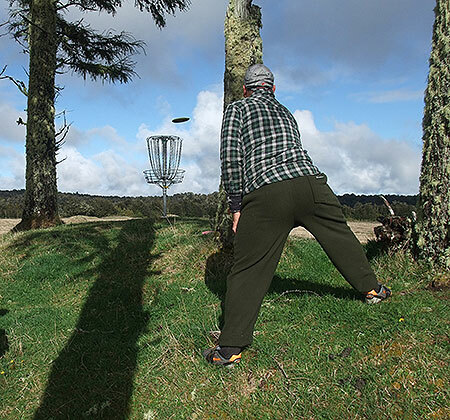 The Straddler - Defending Grand Masters Champ Mike Proctor finds his way through the tall timber. Positive Vibes - The Lost Tribes Pete Boyle is always a pleasure to share a round with. 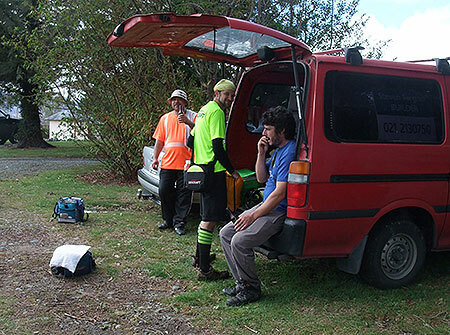 Done and dusted - Team Wellington's Winston, Brady and Stephen wind down ahead of the 4 hour drive back to the capitol. 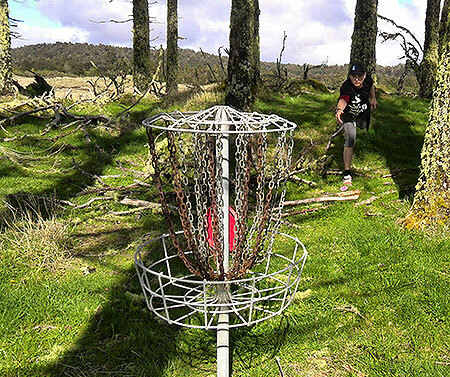 On the level - Wellington builder and Disc Golf addict Stephen Fargher with a great run at the chains. Please don't go through! - Gemma Sullivan tests the trick pin placement on 9. Normally his strong point - Jacko Sullivan's putting ran hot and cold over the weekend. Bit like the weather. Representing - On his way to winning the event Auckland's Brad Muir striking some good form ahead of playing the Oz Champs in a few weeks. Smokin'! 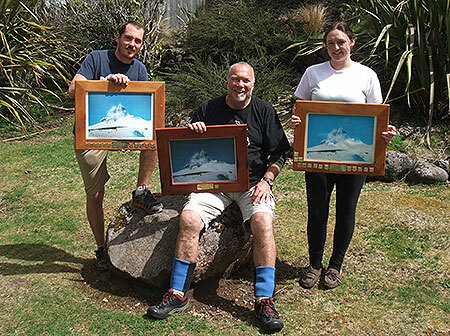 - The winners with their 'Smokin Mountain' trophies. Brad Muir Open, Bob Gentil GM and Gemma Sullivan Woman's.